As Uber and Tesla have learned, it doesn't take a lot of bad press to shatter public trust on autonomous vehicles. Ford has taken that lesson to heart, saying it would rather instill confidence in self-driving cars than be first to market. In a letter to the US Department of Transportation (DoT) and 44-page report called "A Matter of Trust," the automaker detailed how it plans to safely test its self-driving vehicles on public roads. Why the emphasis on trust? The death of a pedestrian involving a Uber self-driving vehicle with a safety driver in particular seemed to affect the public's opinion of self driving cars. Prior to that, 44 percent of US adults said they'd be okay riding in autonomous cars. However, a more recent Pew survey showed that three-quarters of participants would rather not be driven by robots, and half said they'd never buy a self-driving car. Considering the rush to develop the tech, that's pretty bad news. Automakers and tech companies like Mercedes, Toyota, Waymo and others have heavily invested in the tech, and begun testing vehicles on public roads. Toyota and NVIDIA, however, temporarily halted testing following the Uber accident. Ford provided a fair amount of detail about its efforts, showing how it would train safety drivers and handle system malfunctions, hacking and accidents. All of its self-driving cars will have black box-like "Event Data Recorders," much as airliners do. "It's about a holistic strategy to reduce the risk of failures and protect people in case something does go wrong," Ford said. Right now, Ford is testing self-driving cars in Miami and working with Postmates and Domino's Pizza. 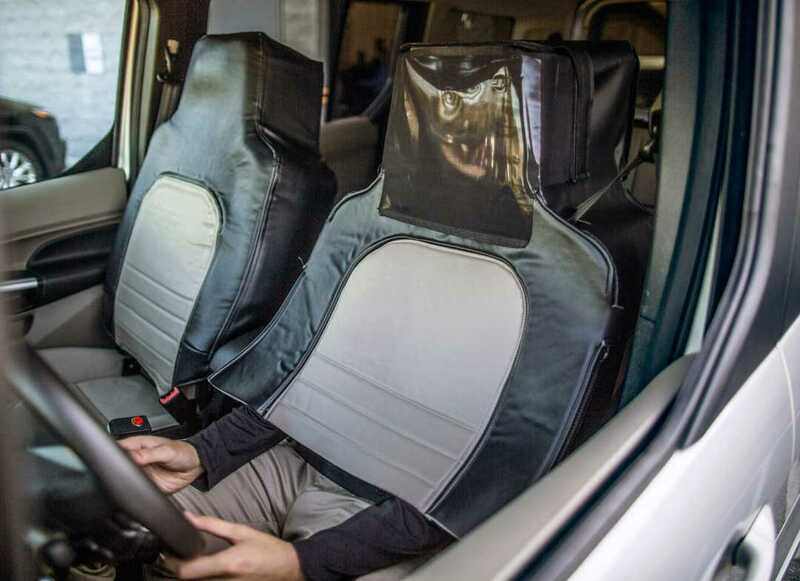 The company famously tested pedestrian reactions to autonomous cars by disguising a driver as a seat (above). Ford plans to start producing self-driving cars without steering wheels by 2021, later than other automakers -- GM, for one, plans to launch such vehicles as early as next year. Judging by the Medium release of the letter and glossy report, "A Matter of Trust" is aimed as much at the public as DoT Secretary Elaine Cho. Waymo and GM have submitted similar safety reports, so the three companies are keen to show that they're approaching self-driving in a professional way. Considering recent autonomous vehicle setbacks and foibles, Ford is also being the most realistic about it.